Final Year Undergraduate Student Jessica Danielle Shenika Madanayake speaks about Comic Con and her dissertation on Poldark. As a third year student doing English Literature with Creative Writing, I found that doing my dissertation on something that I was passionate about opened up possibilities that I could never have imagined. Whilst I only wrote the actual piece this year, the journey began back in my first year of university. It was my mum who first introduced me to Poldark, a historical drama based in Cornwall. My favourite actor, Aidan Turner, was in the main role as Ross Poldark. As soon as I started watching the show, I was hooked by its intricate storyline, stunning visuals, and of course the cast. As I generally do with everything I become a fan of, I took to Twitter to voice my newfound love for the show. There were plenty of people online who shared my love, and I soon became part of a community of Poldark fans online. On Twitter, there were people that I could talk to about the series. Every Sunday, when the episodes aired, everyone would live-tweet their reactions. Even the official BBC Twitter account would join in. As well as giving me something to look forward to every Sunday, I immediately felt like I had gained a whole new group of people that I could talk to. A lot of them had read the books, or had watched the original series from the 1970s. And many of these fans were also fans of Aidan Turner. A year after I had started watching Poldark, I saw on Twitter that Aidan Turner would be attending MCM London Comic Con that year, along with the other two stars of the TV show, Being Human. I had been to two Comic Con’s before this, but this to me seemed unbelievably lucky. After buying the tickets, I watched as many Being Human episodes as I could before the day. Since I was revising for my second year exams at this point, I didn’t see as many as I would have liked to! Being Human is about a vampire (played by Aidan Turner), a werewolf (Russell Tovey), and a ghost (Lenora Critchlow). Because of my interest in the supernatural, I knew even before I started watching the show that I’d enjoy it. At Comic Con, the cast were friendly and approachable. I was shaking as I walked up to the three main actors, and it must have been obvious that I was nervous. I gave Aidan Turner a four leaf clover, telling him what a huge Poldark fan I was. Despite the very short amount of time that we had, he made sure to hug me and thank me for the gift before the photograph of myself and the rest of the cast was taken. It was absolutely unforgettable. Afterwards, I took to Twitter to tell the other online fans. I found that lots of other people I knew had been at Comic Con too, and the kindness from the online Poldark community was astounding. By my third year at university, one year after Comic Con, I found that I was struggling to choose a dissertation topic. From researching, to planning, and finally writing, I knew that it would be important to be passionate about my chosen topic. I considered looking at Young Adult Fiction, Victorian novels, and then eventually settled on Shakespeare. I loved the plays I had picked and had already started my planning. But as I carried on, I started to worry that I wouldn’t be able to create something original enough. That’s when my mum suggested Poldark. She knew that this was something I was passionate enough about to really put my heart into. I had a meeting with my tutor, Dr. Beth Palmer, who told me that I’d be able to do Poldark. As well as reading the books, she was able to help me every step of the way. As well as this academic support, the enthusiasm from the Poldark fans on Twitter really helped motivate me to see my work as more than just another assignment. The topic I chose was to look at heroism in the book series, as well as the new television series. While I was working on my dissertation, I was again informed by Twitter that Aidan Turner was going to be doing an event in London. The event, which took place a few weeks after I had submitted my dissertation, was called, “Ross Poldark: Old-Fashioned Hero For A Modern World”. This seemed perfect, because that was essentially what my dissertation was arguing. My argument was that heroes in the novels and the 2015 series of Poldark are deeply flawed, which is what allows them to still be relatable to audiences in the present day. 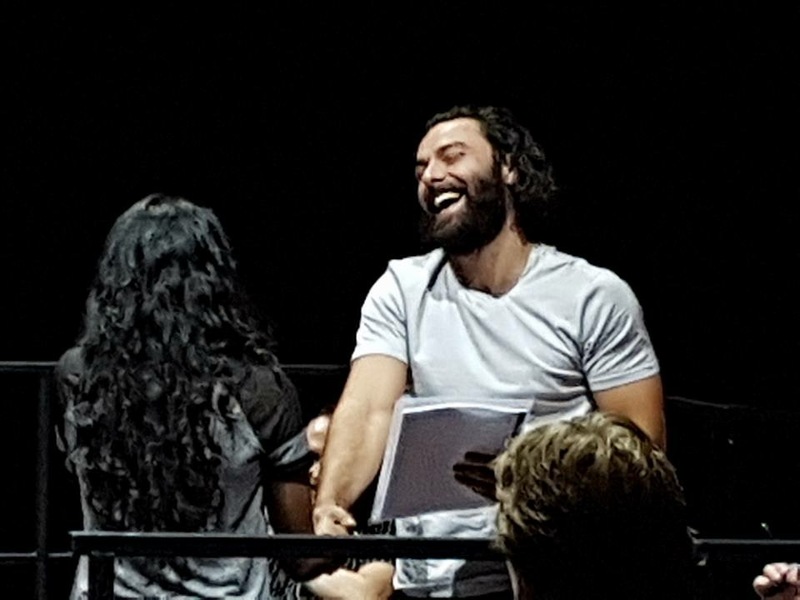 I didn’t think I’d be getting a chance to show Aidan Turner my dissertation, but since I had a spare one printed I took it with me to the event. The BFI IMAX cinema in Waterloo was packed with people, young and old. The event was mostly an interview with Aidan Turner, the screenwriter Debbie Horsfield, and the producer, Damien Timmer. After the session, there were ten minutes set aside for questions from the audience. The interviewer started looking up at the crowd, choosing people to ask questions. So many people had their hands up, and it was looking unlikely that I’d be able to tell anyone about my dissertation. But then my best friend, Najdah, cleverly used the light from my phone to attract the interviewer’s attention. The microphone was passed over to me, and I stood up and addressed my favourite actor once again. The first thing I asked was whether he remembered me, and the four leaf clover that I had given him the year before. He said he did remember, and that it had given him good luck all year! I then told everyone on stage that I had done my dissertation on Poldark, and that I wanted to give it to him. I never imagined that I’d be able to give him my work, a good amount of which was written about his character in the show! I walked to the stage and shook Aidan’s hand, and gave him my dissertation. He thanked me, and said that he would read it. The day after the event, I received messages from Poldark fans on Twitter, telling me that they had seen pictures of me giving Aidan Turner my dissertation! It took some tracking down, but I was able to find the people who had taken the pictures and ask permission to use them. The kindness of strangers was unbelievable. After I got my dissertation mark, I was personally gutted. But the support of people online, as well as encouragement from my supervisor Dr. Beth Palmer and other lecturers, really helped me to accept how the whole experience ended. And as my mum said, what could be more valuable than knowing that the man who plays Ross Poldark has read my work? Having seen the collision of my academic life and my fandom life, this experience taught me that it is possible to connect the two. As it turned out, the experiences that I gained were far more valuable to me than my eventual mark of a 2:1. When I was working on the dissertation, I would never have thought that any of this could have happened. I’m now going on to do a Masters in English Literature, and until then I’ll be watching the new series of Poldark that will be coming out soon! Click here to read Dani’s dissertation.